Standby Buster is a remote controlled device which enables all electrical appliances plugged into it to be completely switched off so they use no electricity at all. This saves electricity and helps to reduce your carbon footprint. The manufacturers of Standby Buster quote statistics (from Which?) which suggest that, for a typical array of electronic entertainment equipment, avoiding standby will save £40 per year and reduce carbon emissions by 245 Kg *. * at 7p/kWh and 0.43 KgCO2/kWh. Working in a similar way to Bye Bye Standby, Standby Buster consists of an electrical socket into which one appliance (or a two-, four-, or six-way adapter) can be plugged. 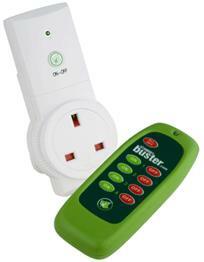 The Standby Buster is simply plugged into an existing socket, and the devices to be controlled plugged into it. A radio frequency (RF) remote control with 30 feet of range is used to switch power on and off. Instead of leaving appliances in energy wasting standby mode, the remote control can be used to switch the socket on and off, and so to provide power for the appliances only when it is really needed. 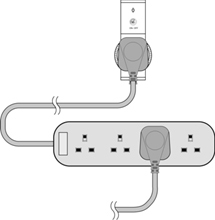 As with Bye Bye Standby multiple Standby Buster sockets can be used in one property. Up to four different zones can be set, and an unlimited number of sockets used in each zone. The remote control has four on-buttons and four off-buttons, one on/off combination for each zone. Therefore it is very easy to control the power in any home or office. Each Standby Buster socket is rated at up to 3,680W and so can easily cope with anything you previously plugged into your 13 Amp mains socket. Click here to visit the official Standby Buster website with detailed information about the product and its accessories, and energy saving tips. Set up instructions from the User Manual are available online by clicking here. A basic Standby Buster kit is available for around £14.99. This kit includes one Standby Buster socket, one RF remote control, and the 12V LRV08 battery for the remote control. A Standby Buster value pack is also available for around £29.99 which comprises the RF remote control, battery, and three remote controlled electrical sockets. We recommend you click here to purchase Standby Buster – low price and fast delivery.